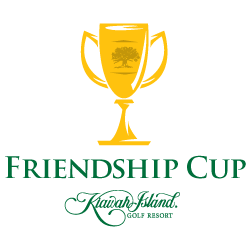 The eighth annual installment of Golf’s Fifth Major, the Friendship Cup, was held March 6-9 at Kiawah Island Golf Resort. The 36 hole tournament consisting of 92 teams playing in a two man best-ball format was contested at the world-renowned Ocean Course, site of the 2012 PGA Championship, and Cougar Point, the resort’s Gary Player design. While The Ocean Course has remained the constant throughout the first seven years of the event, 2014 marked the first time that Cougar Point was used in the rotation. It did not disappoint, as the players raved about the condition of the golf course and the variety of the layout, adding another group of guests who believe Cougar Point to be the resort’s hidden gem. Tournament organizers continue to make the experience of playing the Ocean Course as Pete Dye intended a priority, so the field was split between the two courses on Friday and Saturday to allow for straight tee times rather than a shotgun start. Team “Pops and Caddie”, Jerry and Brendon Czarnecki, took home first place, with a best ball net of -16, four shots better than the two 2nd place teams “Cash-n-Out” and “Lincoln’s Beard”. The winners shot an impressive score at Cougar Point on the first day and managed to hold off a few late charges by other groups on Saturday with a net eagle on the 18th hole at The Ocean Course. All teams finishing in the top 10 earned the chance to choose from a wide variety of prizes, including golf packages at Kiawah and destination trips all across the country. The dreaded “Donkey” award, which recognized the team finishing in last place, is also handed out at The Sanctuary banquet; this year’s winners, “All That Jazz”, finished net +26. The good news for them is that they can blame Friday’s play for winning this dubious award and they can come back next year to try NOT to defend their title. Steven from Atlanta perfectly summarized the overall sentiment from the players, saying, “The Friendship Cup is an event based around great competition and pure entertainment. When you add in the amazing resort and world championship golf courses, it’s undoubtedly one of the best amateur golf events in the world”. The tournament includes three night’s accommodations with unique dinner events at the resort, an assortment of gifts provided by sponsors, two rounds of golf, and three nights of a hospitality suite which features a golf simulator, putting contests, casino nights, and other fun competitions. This year’s sponsor, Nike Golf, set up a virtual store in The Sanctuary and each player in the event was provided with $500 of Nike cash to use on apparel, golf clubs, and golf balls, ensuring that even the teams placing outside the top ten did not leave empty handed. The 9th Friendship Cup is scheduled for March 5-8, 2015, and is already circled on the calendar for many of the players. John from Charlotte, playing for the first time, concluded his evaluation with the following statement: “The Friendship Cup is the envy of all other golf tournaments. I cannot wait until next year”.